The Colors Of Indian Cooking: Mushroom Confidential. Top Secret and Very Hush Hush..It's Not Chicken! Mushroom Confidential. Top Secret and Very Hush Hush..It's Not Chicken! One of my favorite scenes in one of my favorite movies LA Confidential involves the phrase “hookers cut to look like movie stars.“ A gem of a scene, it involves earnest Guy Pearce in the mother of all mistaken identity messes with the real Lana Turner. He thought he couldn’t be fooled. He was. I , on the other hand have always been fascinated by one food that looks like another. I am a sucker for such things. So when I ran across an Indian recipe that called for mushrooms to be cooked like chicken, I was so there. I couldn’t wait to give it a try. A Meatless Monday dish is always a hit around our house, and since fresh spring mushrooms were on sale at $1.99 a pound, it was to economical to resist. About mushrooms and Indian food, even though they may not seem to be a natural fit, they are. Indian recipe collections are filled with mushroom dishes of all heats and varities from the various regions of the subcontinent. This particular recipe comes from Sanjeev Kapoor one of the most celebrated Indian chefs, and his new book How To Cook Indian. 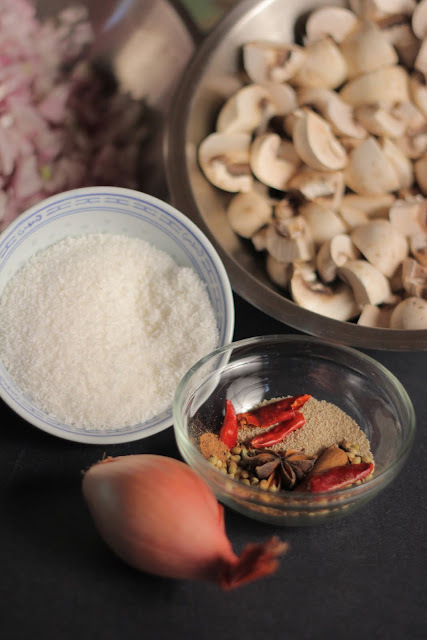 This is an easy recipe that uses a paste of spices to quickly cook ordinary white mushrooms. You know, the ones that don't cost and arm and a leg to purchase. This is not for the portobellos or the shitakes or the hedgehogs or God forbid the Chantereles.These are the plain Jane white or brown, everyday variety mushrooms. Once the paste is assembled, the mushrooms can be cooked in a just a few minutes. It makes a great fast side dish alongside well… real chicken, or you can eat it as we did, accompanied by a couple of tasty vegetarian side dishes. It also seems made for basmati rice though I haven’t tried it that way yet. But believe me I’m going to. Soon. And often! Dry roast the cloves, cumin seed, coriander seed, star anise, chilies, mace, peppercorns, fennel seed and poppy seeds in a small skillet. When the spices start to get fragrant, toss in coconut and toast that too until it starts to brown. Take it off the stove and let the spices cool. Put the spices and coconut in a small blender or food processor with 2 chopped shallots and 1 cup of water. Blend it until it’s a smooth paste. When the oil is hot add 3 chopped red onions. Saute them until they brown. Add in the quartered mushrooms and salt, stir well. Add in the spice paste mix well. Add 1/2 cup of water and the tamarind pulp or lemon juice. Simmer everything together for about 5 minutes or so until the mushrooms are cooked through. Sprinkle a bit of chopped fresh cilantro over the top and serve. This looks so goooood! I have to try it. Loved the movie. Kathy! Loving the meatless mushroom bonanza! - How did the anise work? Seems it would make everything else just pop... great to stop by! the fennel seed was wonderful and the mushrooms tasted even better the next day as leftovers. love that movie, mushrooms cooked like chicken!! awesome, love the flavors of corainder and mace together! LOVE mushrooms! And I love these flavors (you know how much I do!!) Going to try this. Love both the movie and "Plain jane" mushrooms:).... incredible dish!! Nom Nom Nom Kathy...what a wonderful meatless Monday entry. I'm lovin' it! Brilliant flavours. TOTALLY looks like chicken! And sounds delicious! My family is a fan of aromatic and spicy food. This recipe is great. Mushrooms actually have a meaty taste. I'me sure the meat won't be missed. Love mushrooms! The idea of fennel with this - yyuumm! Thanks!